We all take a lot of pictures and we need a way to edit them. Apple offers the free Photos app with macOS; some of us use the more powerful Adobe Photoshop products. But when we need external image editing software, Pixelmator can be the software for the rest of us. At $30, many of you may think it is not even worth looking at, but don’t judge a horse by its color. The latest version of Pixelmator (with the code name of Cordillera) has a lot to offer. Most of the tools you’ll find in the full Photoshop CC from Adobe are available in it, and the layout of the Tools palette is shown in pretty much the same order. 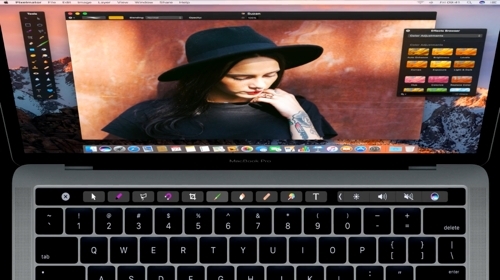 This version of Pixelmator adds, among other things, the support for the new MacBook Pro Touch Bar, tabs, and macOS Sierra compatibility. In regard of compatibility and updates, I saw on Mac news sites that Pixelmator is very quick to add features once Apple announces them as publicly available. Making a good selection is the most important task in image editing. A good selection allows you to make changes to the area you want to refine, and leave the remainder of the picture untouched. I remember over ten years ago making a good selection in Photoshop Element (around version 2 or 3) was painful. In that regard I was happily surprised to see that Pixelmator offers a good choice of selection tools that work accurately. 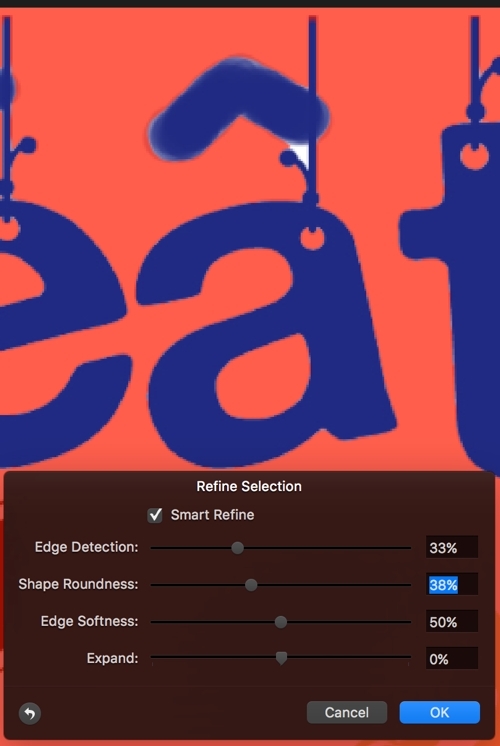 The latest version offers a Smart Refine feature, which is close to the Select and Mask (formally known as Refine Edge) in the full Photoshop CC. One of the most used features in image editing is layers. 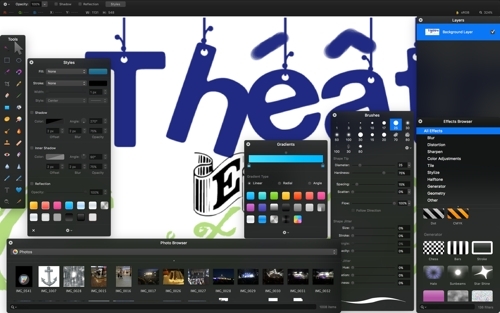 Pixelmator is no exception and it offers close to the same set of features found in Photoshop CC or Elements. You can add layers with layer masks and blending modes as expected. You can enable or disable a layer, group some layers of your choice, name each layer/group, lock or merge them. The software also has a Style palette that is close to the Layer Style found in Photoshop CC. Some features are similar but implemented differently. As an example, the often used New Layer via Copy found in the Photoshop CC Layer menu is translated to the Edit/Duplicate menu function in Pixelmator. It took me a while to figure it out, but it gives the same result. One layer function that Pixelmator does not have is Adjustment layers. You can accomplish a similar action by duplicating a layer or selection and applying an effect from the Effects Browser. Note that it is destructive (applied directly to the pixels), and you won’t be able to disable it like you can in Photoshop, which is why I suggest you duplicate the layer first. 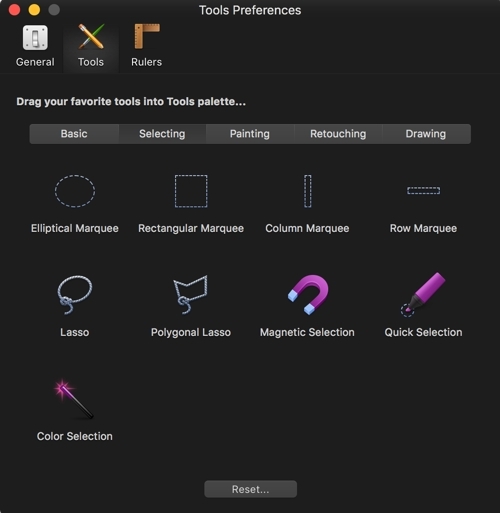 In many areas, I find the dialogs or tools offered in Pixelmator to be more innovative than Photoshop CC. 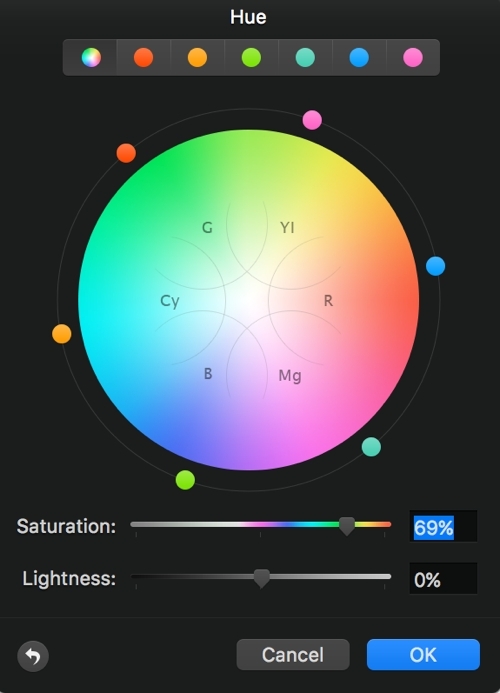 For instance, the Hue dialog box has a unique way to change the color of a selected object in your image. Instead of using sliders on straight lines, it shows a wheel you turn around to change the color. Pixelmator has a lot to offer for the price tag, but it sure misses some of the fancier features of Photoshop CC. For example, if you’re using the Content Aware features of Photoshop, you won’t find an equivalent in Pixelmator. Some others are just named differently, such as the Effects Browser that is very close to the Filter menu of Photoshop CC. If you ever used any version Photoshop, you’ll probably have a small learning curve to adapt to Pixelmator. It is not an impossible task to accomplish. If you’re worried about learning to use Pixelmator, the company provides free tutorials on their web site. Integrating as an external editor in Lightroom is very straightforward too. If you use Apple’s Photos app, Pixelmator adds a few Extensions that can be used directly under the Edit Photo button. While there are only two extensions shown in the menu, they both have six very powerful tools you can use right away. For instance, by using Pixelmator’s Distort extension, you get a tool that’s very similar to the Liquify tool in Photoshop CC. Another great Mac integration is the addition of five actions to Automator. 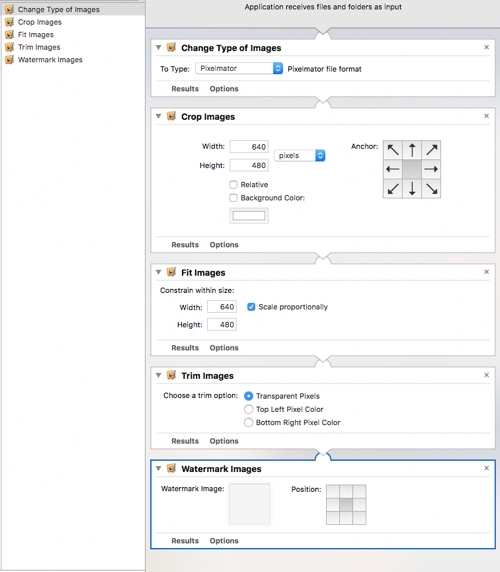 If you’d like to crop of bunch of images, or add a watermark, it can all be automated quite easily. 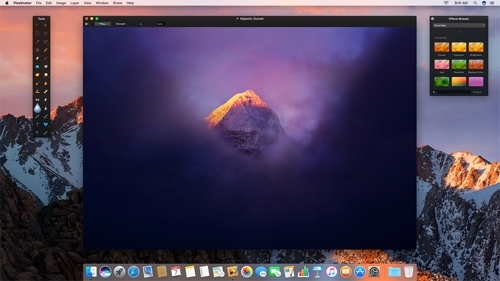 The software, which is only available from the Mac App Store, uses Apple’s Core Image and OpenCL technologies found in macOS to leverage most of its power. 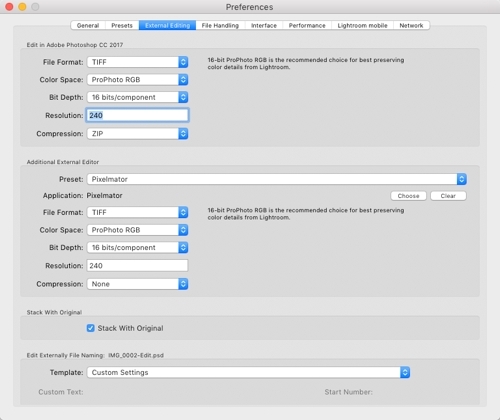 For the users, it means Pixelmator can utilize all the power provided by your Mac, including the optimization made by Apple to optimize the GPU usage for image processing. It also supports 64-bit architecture, which gives you the best performance your computer can throw at you. Pixelmator has many palettes that can be displayed at once from the View menu. One of the things I find distracting is that we cannot stack or dock the palettes in anyway, not even in full screen mode. It can be frustrating if you get too many of them open at once, as it blocks the view to the image you’re trying to edit. Not to mention that the palettes themselves are overlapping each other, which adds to the confusion. I can imagine that with a bit of self discipline it is something we can overcome, as it does not remove any power from the software itself. Pixelmator is a straightforward photo and image editing software, and yet a very powerful one. If you are looking for a nice and affordable photo and image editor, Pixelmator may be what you are looking for. At this price range for the set of features you get, you cannot go wrong. If you’re still unsure, you can try it for free. Pixelmator describes their product as a full-featured image editor for Mac, and I agree it deserves that title.